Liberty 50 är lätt, smidig och elegant. Utrustad med Piaggios driftsäkra 4-takts motor med mjuk acceleration, tyst gång och utmärk ekonomi. De stora hjulen bidrar till den tidlösa designen samt gör den extremt enkel att hantera, speciellt i storstadstrafiken. Liberty 50 erbjuder både acceleration, tillförlitlighet samt extremt låga driftskostnader. Det breda fotstödet, den låga och bekväma sitsen samt den tydliga instrumentpanelen gör den bekväm och praktisk. Förvaringsutrymmet under sitsen förenklar genom att rymma både hjälm, lås och lite till. Finns som både klass 1 & 2 -moped. 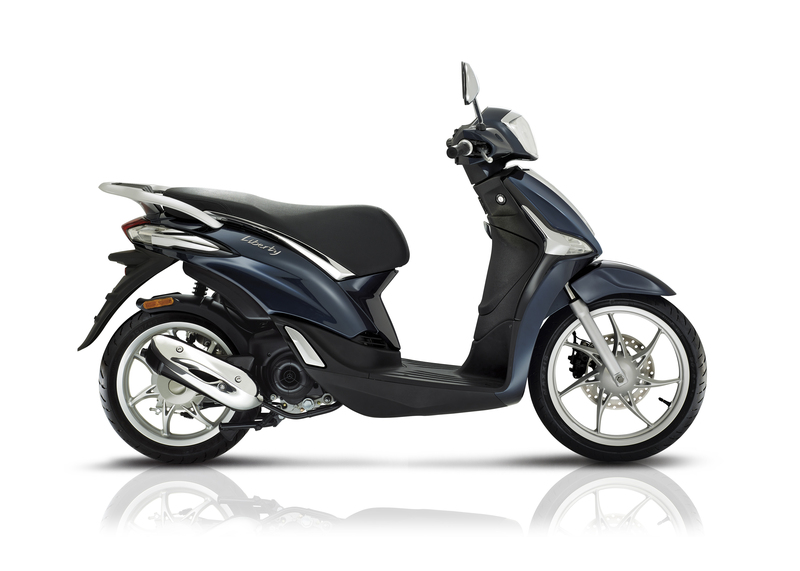 Piaggio Liberty is a milestone in two-wheeled mobility development. It is synonymous with independence and freedom. Introduced in its first version in 1997, Liberty is one of those rare products that, model after model, has managed to remain faithful to itself and its name, continuously modernising and meeting the needs of new generations of customers. Piaggio Liberty has skilfully achieved great success, finding favour with the most advanced customers, because of its ability to meet the needs of mobility and freedom with a formula that combined style, light weight, an easy ride and safety. After 19 years of successful sales to the tune of over 900 thousand units, Piaggio Liberty has been completely revamped but in line with the values that inspired the original project and with the goal of meeting the demand – increasingly stronger – for a vehicle characterised by superior quality levels, lightweight and sturdy, easy to use but with impeccable performance and with high technological content at the service of safety, such as the ABS braking system that comes standard on the 125 and 150 cc versions, both Euro 4 compliant. New Euro 4 engines and new active safety systems on the 125 and 150 cc version, new ergonomics and new elegant lines to go with the large diameter wheels which, from the very first Liberty, gave a compact scooter all the dynamic safety of superior class vehicles, contributing to it being concretely established in the “high wheel” segment. The dimensions have increased and, along with them, so has comfort in the saddle. New and technological engines are here, the front wheel diameter has increased and consequently so have the active safety margins. 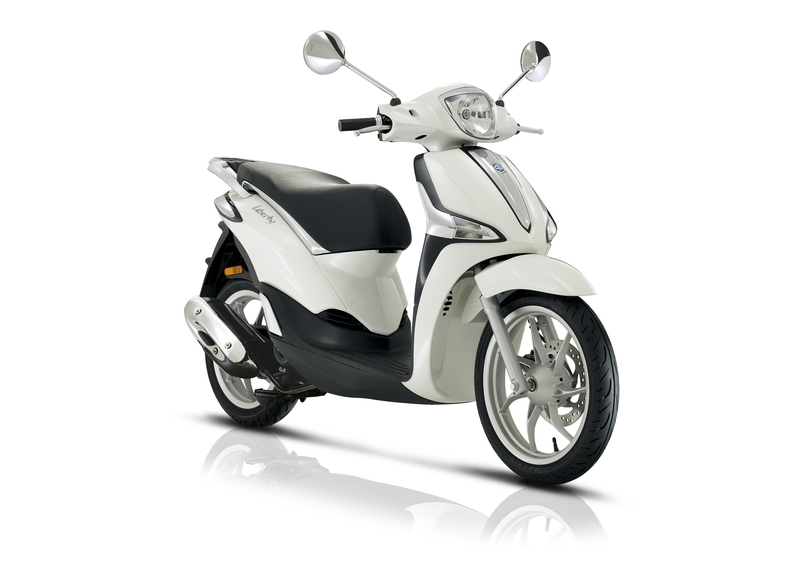 The light weight, user friendliness and natural charm of the product remain unchanged, even in the presence of a more “important” vehicle, confirming Liberty as a scooter capable of satisfying the widest variety of customers: from the very young who will find a perfect entry level vehicle, to the young and more mature rider looking for safe, easy mobility with low operating costs. The family of Piaggio i-get Euro 4 engines in the air cooled version is introduced for the first time on the Liberty, a unit that represents the cutting-edge of the respective engine capacity segments. The new powerplants are the result of a design philosophy that sets new and more advanced quality and reliability levels – along with low consumption and emissions – as its primary objectives. Every aspect of the design was aimed at increasing the efficiency of each individual part in order to contribute to maximising performance. More than one million kilometres which have already been ridden during the testing phase of the first Piaggio i-get engines are a testament to the attention to quality and reliability in the development process of the i-get engines which, thanks to the modular nature of the project, can be provided in liquid or air cooled versions with 3 or 4 valve timing. The Piaggio Liberty comes in three different engine versions – 50, 125 and 150 cc – to meet any mobility needs, with such points in common as brilliant performance in the respective engine capacity categories, the quality and reliability of the powerplants, low operating costs and the contained emissions, including noise. All of the Liberty engines are ultra-modern 4-stroke, air cooled and electronically fuel injected. Each and every detail, from the exhaust to the internal design of the gearbox cover, all the way to the new air filter, has been redesigned to make the ride smoother, quieter and more comfortable. 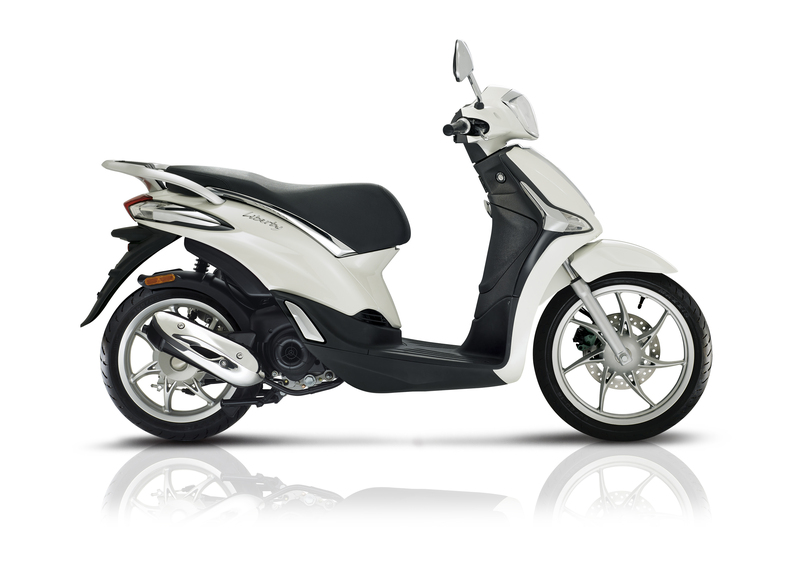 The 50 cc 4-stroke engine is a true jewel, with an entirely new thermal part. Characterised by the 3 valve timing system that distinguishes the i-get family, the fifty is the result of a design that aims to maximise quality, reliability and implement an extraordinary reduction in consumption and harmful emissions. It is the perfect drivetrain for a very young person’s first ride, and the new rider will certainly appreciate the brilliant features that combine with marked operating savings, thanks to the fuel consumption which is contained to 58 km/l at a constant speed of 40 km/h. In terms of environmentally friendliness in the city, the usual stomping grounds for the new Liberty, the new engine keeps noise to a minimum thanks to the development of new gearbox settings that allow the single cylinder to maintain quick performance while still being “docile”, in other words, at a lower average rpm compared to the engines in the previous generation. The result is a reduction in mechanical noise in addition to lower fuel consumption. The engines that equip the Liberty are characterised by a new injection system with improved efficiency and boast superior performance, both in terms of power and torque, all to the advantage of acceleration from low rpm which translates into a new quickness and responsiveness in typical stop and go city riding. A new eight-hole injector delivers the fuel in a fine spray for optimum combustion. In particular, the new Piaggio 125 cc engine is more than 10% more powerful than the engine in the previous Liberty version, with a 16% drop in fuel consumption. The 150 stands out for its superior brilliance which makes it a more satisfying ride in any conditions: 9.6 kW at 7,750 rpm and torque of 13 Nm at 5,250 rpm guarantee plenty of torque at any rpm and make the Liberty ABS particularly lively both in city traffic conditions and on the open road. All whilst maintaining extraordinarily low fuel consumption, up to 57 km/l at a constant speed of 40 km/h. – the barometric sensor, so that combustion is always optimised. Particular care was dedicated to defining the scooter’s new clutch, designed and developed to maximise riding satisfaction. More specifically, attention was focused on power management both in phases of slight acceleration and in “stop and go” riding which is so typical of the big city and traffic jams. The results, from the rider’s point of view, are a smooth and soft ride that, combined with the engine’s increased power, provide an experience that is always pleasant, smooth and jerk-free. The Piaggio Liberty is the result of a development process which, from the very first design phases, set as its goals the superior final quality of the vehicle and performance, as well as keeping customer satisfaction at the centre of the process. Targets such as perfect ergonomics, user friendliness, handling and stability and low fuel consumption and emissions with more and more lively performance stem from an attention to the end customer in order to provide the market with an ultra modern, high performance, stylish and well crafted vehicle with which to distinguish themselves even when riding in the most elegant metropolitan environments. The new Liberty family boasts superior construction quality that shines through not only in the reliability – an essential value – but also in the physical perception of top shelf finishing. The new materials, the new treatments, the combinations and even the colour choices, all contribute to a sensation of perceived quality that can satisfy even the most advanced customer. The solidity of the Piaggio Liberty and each one of its components is a clear trait of the new vehicle, as is the painstaking care for each and every detail which comes out in aspects which are anything but secondary such as the modular feeling of the throttle, the perfect construction of the storage compartment in the leg shield back plate, the materials selected to cover the seat, the sound of the engine, the absence of vibrations and the feeling during braking. This is a construction process that significantly raises the Liberty’s global quality level and which allows us to offer the customer a valuable and reliable product that will maintain its advanced characteristics over time. Superior handling for an absolutely easy ride, uncompromising stability at even the highest speeds for undisputed safety: these are the “guides” that inspired the design of the new Liberty frame, the new fork geometry, the implementation of a new front wheel – now 16 inches in diameter – and then the selection of the materials for the chassis and the highest possible quality components. The Piaggio Liberty frame, completely new, is a sturdy single cradle structure in tubular steel with pressed sheet metal elements. The new torsional rigidity (+15%) and longitudinal stiffness (increased by 17%) mean decidedly better handling and riding stability for the user, worthy of vehicles in a superior class, with a feeling of absolute control over the vehicle. Liberty has always been a prominent player in the “high wheel” scooter segment. Faithful to its philosophy of a lightweight and manoeuvrable, but also stable and safe vehicle, precisely because of the large wheels, it continues in this direction with an increase in front wheel diameter which goes from 15” to 16”, guaranteeing even better stability at faster speeds. Both rims are characterised by their attractive seven split spoke design at the centre and are made from aluminium alloy. 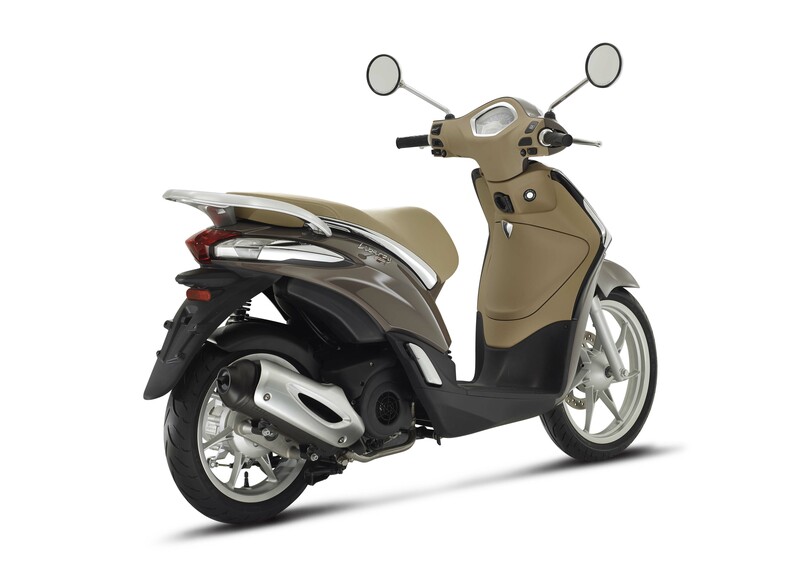 The ABS that equips Liberty 125 and 150 cc was developed by Piaggio with Bosch, the largest automotive parts manufacturer in the world. The electronic braking control system prevents the front wheel from locking up in the event of sudden stops or on slippery surfaces, another important step forward in the vehicle’s active safety. The braking system, even on the 50 cc version, is made up of a 240 mm front disc, gripped by a Nissin calliper and a reliable and tireless 140 mm rear drum. Piaggio Liberty, in its various versions over the years, has always been an icon which has contributed to creating the high wheel scooter phenomenon. A perfect representation of Italian style and elegance, it has set itself apart in a segment where beauty is often sacrificed for functionality, successfully combining practicality and elegance. The latest version of Liberty embodies and advances all of the style that has characterised its heritage, beginning from a basic harmonic and fluid design that emphasises characteristics such as handling and practicality, combined with a precious Italian style. 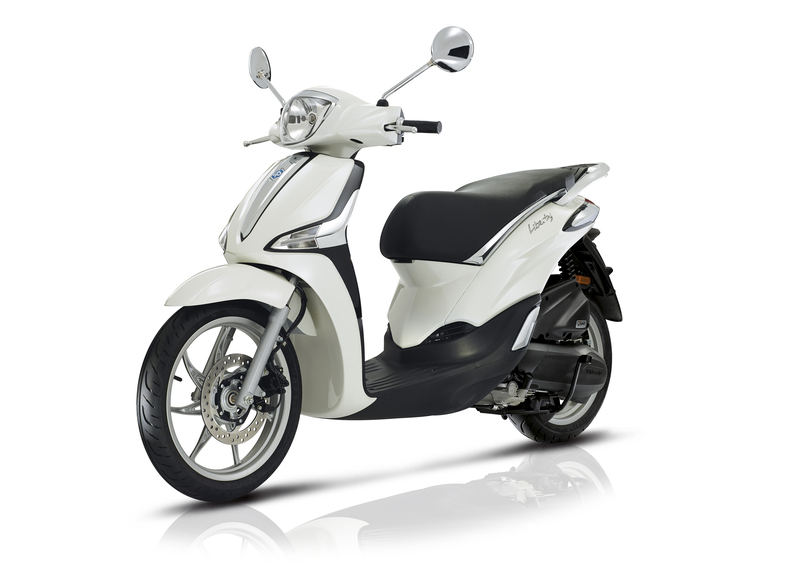 The new generation of Piaggio Liberty immediately exudes a sensation of quality and sturdiness and it does it being more dynamic, larger and more comfortable, but without straying from that original spirit that made it so successful. Its proportions have not be revolutionised and great attention was given to the overall ergonomics of the vehicle, placing the rider (whether male or female) at the centre of the project in every phase of development. The front shield becomes even more protective without sacrificing the vertical aesthetic element which has become a characteristic of all Piaggio production, thanks to which the family feeling of the Italian manufacturer is completed and it thereby acquires an even stronger formal sense of belonging. The new front expresses a richer and more technological image. In the 125 and 150 cc versions the daylight running lights are now LED and, taking advantage of light guide technology, they work together with the main headlight source placed on the handlebar, characterising Liberty and making it as recognisable in the dark as it is during the day. The handlebar is also new. To correspond with the new headlight unit on the front, there are new controls on the rear, more complete for easy control of all the new features which are displayed and managed on the new on board panel. The instrumentation is a definite leap forward compared with the previous Liberty version. No longer mechanical, but electronic now, it integrates the elegant traditional reading with the presence of a modern LCD display that has button controls on the right side of the handlebar and provides all the information you need to manage the vehicle. In the leg shield back plate, thanks to the battery being moved, space is practically doubled for the glove-box which goes from 2 litres on the previous Liberty to almost 4 on the new model. As optional equipment the space is installation-ready for a convenient USB socket to recharge your smartphone. The entire structure of the convenient glove-box is created with great attention both to material selection and treatment. The result is high quality which is immediately clear simply by opening and closing the compartment. The storage space for cargo or helmet storage in the compartment under the seat also increases from 12.5 to 17 litres, 30% more than before. The saddle, completely remodelled and particularly large, has been lengthened for greater comfort even when riding two-up. It is covered in high quality look “eco leather” and enhanced by stitching that highlights its sinuous shape. At the base of the seat an innovative chromium element enhances aesthetics with a purely decorative function, slimming down the rear part of Liberty, but including a groove which makes it easier to open and close. A wireless remote control built into the key with a “bike finder” is available as optional equipment that activates the turn indicators. This is a convenient device to help you locate your vehicle in a crowded car park. The tail of the vehicle takes on a more important presence in the overall image of the new Liberty. The increased cargo capacity meant increasing dimensions without interfering with its stylistic purity. The shape of the rear, smooth and harmonious, ends with a completely revamped light cluster. The surfaces of the tail, sculpted and modelled, blend with the Liberty’s side elements, in other words, the guards that protect one of the most exposed parts of the body from impact. These elements are coordinated with the ones that protect the front shield and they include elegant chromium elements. 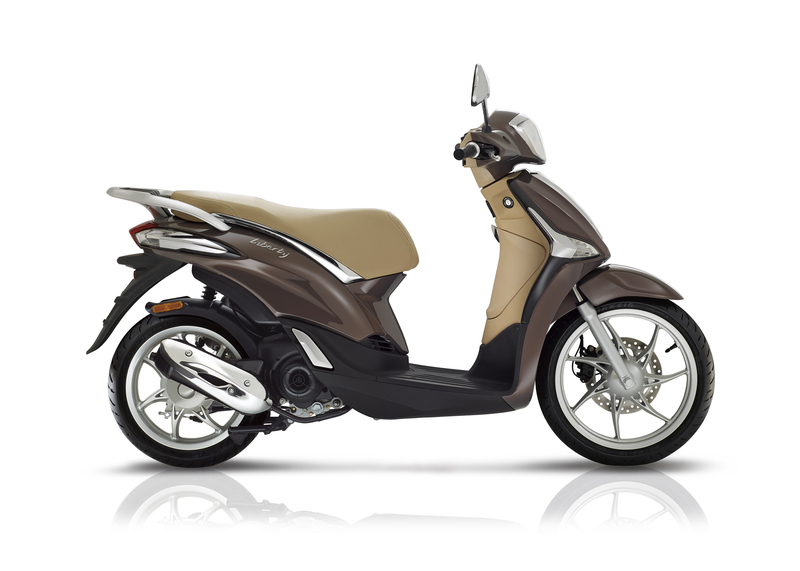 For Liberty, Piaggio Group’s technology expresses a range of highly technological accessories, a true exclusive for a scooter in this category. Electronic antitheft system – The most compact in its category, characterised by the lowest power consumption available on the market. It is self powered and therefore does not depend on the vehicle battery. Bike finder – A system for quick vehicle identification, particularly useful in crowded car parks, it also functions as a wireless remote control to open the helmet compartment. Piaggio Multimedia Platform (PMP) – This is the multimedia system developed by Piaggio that lets Liberty dialogue with your smartphone, displaying all of the trip information and scooter performance information on the screen through a free APP with a clear and user friendly graphic interface. For the Liberty a full catalogue of classic accessories is not lacking. Windshield – Made in 4 mm impact and crack resistant methacrylate, it has built in handguards and an elegant black cover for the mounting rods. 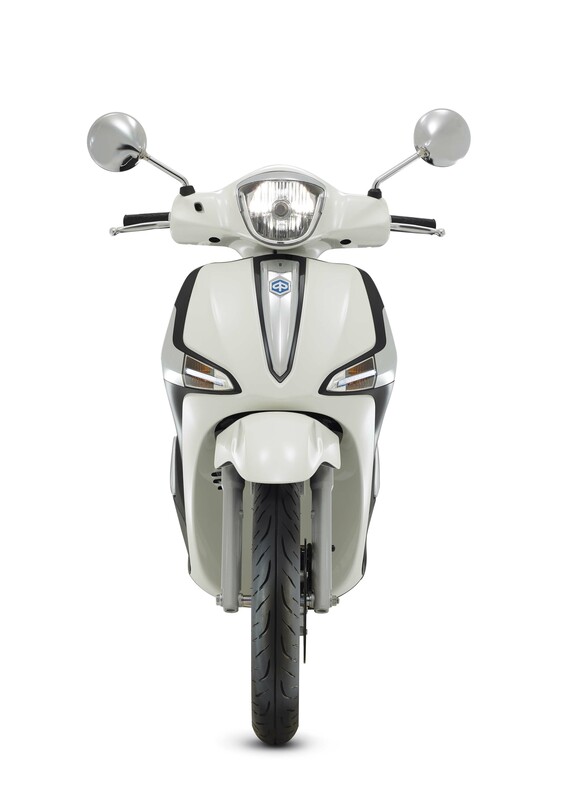 Top fairing – Piaggio tested and approved, it provides protection and enhances the lines of the Liberty’s front end. Made in impact resistant methacrylate, it adopts black covers for the rods, a contribution to style and a decidedly elegant accessory. Top box – The impressive 30 litre capacity means that it can hold a flip up helmet to make this classic accessory extremely useful. On the new Liberty it is available in two versions: top box with embossed finishing and top box painted to match the vehicle body. Both have an internal mat and are installation-ready for the backrest upholstered in the same material as the saddle. Saddle-handlebar mechanical antitheft system – Extremely simple and effective, it “binds” the handlebar to the vehicle thanks to a sturdy fastening system locked to the body. Vehicle cover – For outdoor vehicle storage, made in water resistant material. Leg cover – Designed specifically for the new Liberty it fastens perfectly, thanks in part to the anti flapping system that guarantees maximum protection. It has a steel cable antitheft system and a waterproof saddle cover. Side stand – Complete with safety sensor to prevent starting with it down. Rubber mat – Perfectly adaptable to the Liberty footboard, it is made in anti-slip material and enhanced by chromium finishing.